We love cast iron skillets. We love their look, their feel, and how they add flavor to food. If you have ever cooked with cast iron, then you know exactly what we are talking about. And you also know that they can be expensive. With proper seasoning and care, a single quality cast iron skillet can last a lifetime. They can become heirlooms. 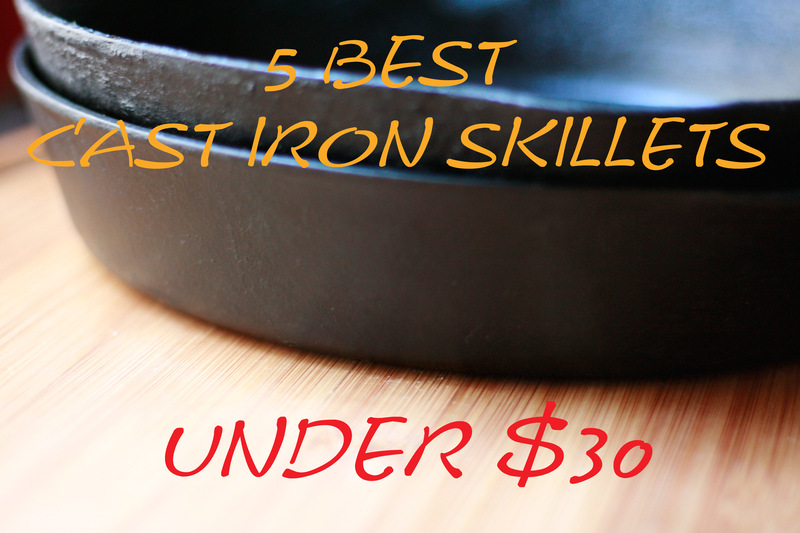 But the best cast iron skillet isn’t always the most expensive one. In fact, it’s not difficult to find one in any price range. In this review, we gathered a list of five of the best cast iron skillets we could find under thirty dollars to see if any of them had the potential of becoming an heirloom. 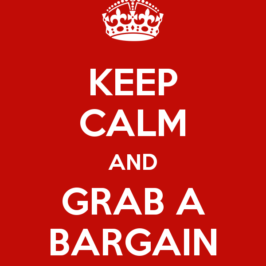 Note: Pricing is as of December 18, 2015. We found that the Utopia Kitchen skillet preheated perfectly. When the steak hit the pan, it replied with a satisfying sizzle. While the heat wasn’t as even as we’d have liked, it held heat well enough so that we could fully sear the steak by nudging it with tongs. 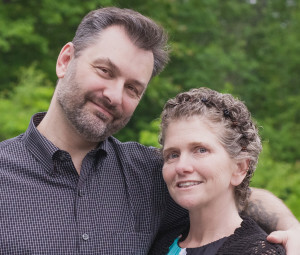 In the end, we were able to hit that medium rare sweet spot all the way around. While we thought that the Utopia Kitchen skillet was all that we could ask for upon the stove top, clean up wasn’t as easy as we’d like. While the pre-seasoned surface kept most of the steak from sticking, it still required a little effort to clean it off what was left. We’d recommend a good seasoning soon after purchase. 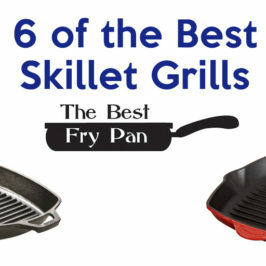 Finally, we couldn’t ignore the fact that this skillet comes with a 100% money-back guarantee. It’s always nice to see that. Lodge is an American company that has been producing quality cast iron cookware since 1896. We’ve used them in the past, so when we saw the price for this cast iron skillet, we couldn’t believe it. But that doesn’t mean that we were going to give them an automatic pass for our test. We treated it just like the rest. The Lodge L8SK3 10.25 inch Pre-Seasoned Cast-Iron Skillet comes pre-seasoned, so it was ready to go right out the of the box. 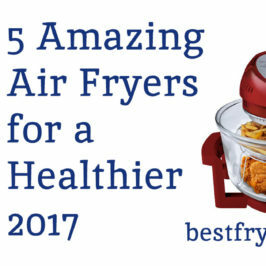 We put it on a gas stove and put it to work on home fries that had been waiting all day in a bowl of cold water. The skillet heated up, and with a little oil, the fries cooked crisp and even all the way through. Again, just as we expected. Because the Lodge skillet holds heat well, we were able to turn down the flame, and keep it down through several batches. And the small handle on the opposite end made it easy for pouring out the oil once we were through. Clean up was easy, with just a rise out and a wipe. Hardly any scrubbing involved. Since it doesn’t have any special coatings that some of the more high-end skillets, we could see that foods that aren’t cooked in oils may require a bit more elbow grease during the cleanup process. However, Lodge does well with their seasoning process, so it will be a long time before it will require any attention. 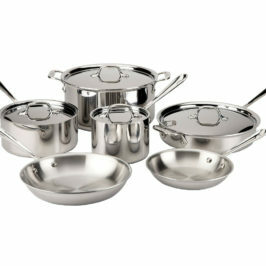 All in all, the Lodge skillet was everything we could ask for in a bargain skillet. Besides the weather, what we found disappointing was the fact that even though the skillet came pre-seasoned, the manufacturer recommended that we season it ourselves. It’s not a big deal as far as caring for a cast iron skillet goes, but we wanted to get right to testing out this bad boy. So, we followed the provided instructions, and then later that day, got to work. We gave the Emril a go with fried chicken. The heating was even and steady, however, the oil seemed to collect around the edges, almost as if the cooking surface were convex. Not much of an issue when frying chicken, but like most cooks, we like our oil levels to stay even. With the freshly-seasoned surface, cleanup was easy considering the aftermath of fried chicken. A little scrubbing with a nylon scrubber was all that was required. This T-fal Cast Iron Skillet is probably one of the heaviest pieces of cookware for its size that we have ever placed on the stove. I was afraid that I’d break my wrist trying to move it from stove top to oven, and my wife wouldn’t dare lift it without two hands. That said, the T-fal promised a great cooking experience. Again, like the Emril it came pre-seasoned, though we didn’t like the look of the factory job. So we seasoned it with our own method (which we’ll reveal in an upcoming post), and then the next morning, we gave it the omelet test, with a side of bacon for extra credit. Once up to temperature, the T-fal skillet held heat like a champ. However, even after our seasoning process, the skillet wasn’t entirely happy to let our omelets go. Same could be said for the bacon. Not that we could blame it, but it’s just not what we were looking for in a skillet. Still, the T-fal holds a lot of promise, and after a few more rounds of seasoning, it might be joining us for a camping trip. That is, if one of us has the strength to drag it out into the woods. When a product has no rating, it’s easy to get suspicious. It’s difficult to form any expectations, and frankly, I was a little nervous about shelling out my money on a product that has no perceived reputation. 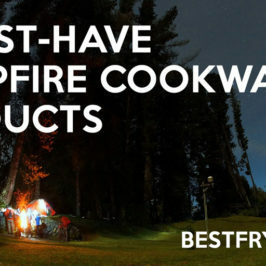 After a little investigation, I learned that the manufacturers pride themselves in producing outdoor cooking gear. So, with that in mind, we looked forward to firing up the grill in the middle of December. The Bayou Classic Cast Iron Skillet weighs all of 4 pounds, which is rather light for a skillet. It comes pre-seasoned, however, the sides and surface was a little rough. Like it was unfinished. That didn’t seem too promising of it quality. Still, we started up the grill and braved the chill for pork loin and a skillet full of veggies. Not much of a test, for sure, but I was only willing to go so far with my dinner. For the most part, the Bayou Classic skillet did its job. It took the heat, but with the rough surface, I spent considerable time trying to scrape off a thin layer of charred peppers from the surface of the skillet. Outdoorsy, perhaps, but with the rough surface and the lack of a secondary handle, we wouldn’t recommend this skillet for any extended camping trips. not even Cub Scouts. While we really couldn’t complain about the price of any of these cast iron skillets, we really didn’t have to debate over the one we liked best. Straight out of the box and on to the stove, it was the Lodge Cast-Iron Skillet . 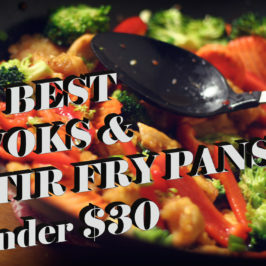 The low price, the full seasoning process, the quality feel while upon the stove, and the company’s solid reputation all proved to be the best cast iron skillet at a bargain price. And one that could rightfully take a spot as a family heirloom. But, if for some reason you can’t get your hands on the Lodge, then we’d recommend the Emeril by All-Clad (once it’s been seasoned, of course). Bryan & Melisa, I don’t know who of you have written this. Great post overall. 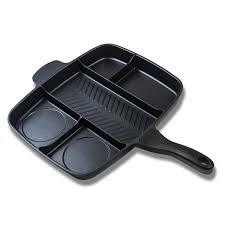 I appreciate your choice that you love cast iron cookware. But my experience and others experience from here and there says that skillets or other cooking utensil (like pots, pans) made by cast iron are sticky and that’s why sometime toxic. Is it true? 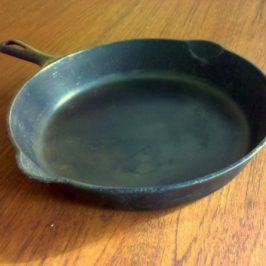 As for sticky and/or toxic cast iron, we would say that an improper seasoning may leave cast iron with a sticky surface. This would require the seasoning to be completely stripped and done all over again. A proper seasoning leaves a perfect cooking surface and helps to impart flavors that you can’t get from any other cookware. This article about how to season a cast iron skillet should be helpful.